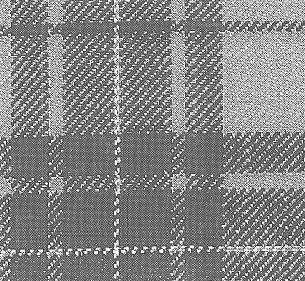 Scottish national pattern, typically used in woollen fabricsand distinctive for its precise adherence to certain rules concerning compositions and proportions of colour. Scottish t. have their origin in the folk dress of the ancient Scottish clans; each clan distinguished itself from the others by the colours and sizes of the checks on its clothing. Some clans had clothing of different combinations of colour for wear on different occasions. Scottish t. is one of the oldest and most aesthetically pleasing of the classic wool patterns; its various types are still referred to by the names of the original clans. The patterns are popular for use in ladies' dresses, skirts, trousers, suits and coats; they are also used for the linings of sports jackets and the overlays of suitcases, and periodically they become fashionable as, for example, a material for men's jackets. The name is given by the Scots "scotal tartan" (= pattern of the clan). Other sources give the origin of the term as the Spanish "tiritana" (= fabric with small checks).